Ah, March Madness. The one month of the year when the world of basketball is accessible and fun for everyone, even the most casual of fans who haven’t paid attention since…well, since last March. As a basketball play-by-play voice, making your broadcast accessible and interesting to the super fans is easy. But how are you at capturing the attention of the casual fan? For the last few months I’ve been randomly dropping in to listen to the basketball broadcasts of STAA members. I started to hear patterns. 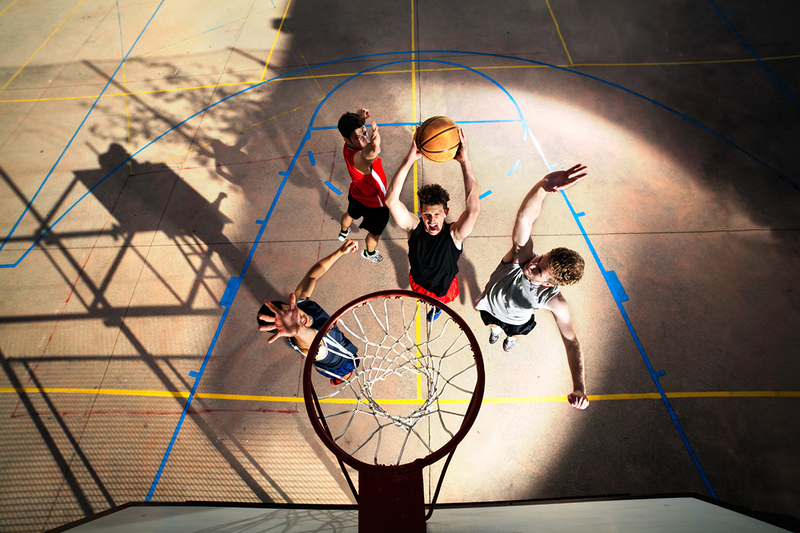 Patterns that yielded four keys to improve your basketball PBP for all fans. 1. Why should I care? This is the number one, most important thing you can do as a broadcaster. I am a casual listener. I don’t know any of the players or coaches, I don’t know if you’re having a winning or losing season, I don’t know if the team you’re playing is a long-time rival… I don’t know any of the things that would ordinarily make me invested in the outcome of this basketball game. I have a myriad of free entertainment options that I can switch to in milliseconds that will provide a quick, cheap laugh. BUT. I am here now. Listening to your broadcast. Humanize the game. Build me a story that peaks my interest and makes me want to find out what happens next. Give me a good reason to stay and I will. 2. Button, button, who’s got the button? Clearly identifying which team has the ball is a point that is covered any time someone talks basketball PBP fundamentals. Probably because it’s hard to do. I listened to six games and only one did a good enough job that I always knew which team had possession. You also need to mind your acronyms. SDSU and SJSU share a lot of letters and when you exclusively use those acronyms to identify the teams, I will be confused. It is extra true when you get excited and slur your letters together. This also applies to high school teams. Mix it up. Use the mascot names. Or the full school name. Enunciate. 3. Something exciting happened! Now recap. Dude! Your elevated energy level just signaled my brain that something exciting has or is about to happen! …And now that you have my full attention, please recap the dramatic thing that just went down. Yes, you obviously need to wait until the play has run its course, but after that is the perfect time to do a recap. Tell me what I missed leading up to that cool moment because I was only half-listening while I was working (or making dinner/changing the oil/running intervals/you get the idea here). Put the moment in context and note any potential consequences. Oh hey, you know what else your timely recap did? It gave me a reason to be invested in this game. Nicely done. 4. Stop with the detailed stats. Please. You work in sportscasting. I know you’ve heard that advice many times before because I have it heard it many times (and I don’t work on-air). And yet, I heard a lot of stats during these games. A rare few stats were truly impressive. They added value to the game experience. The rest were stats that threw out so many numbers they all kind of ran together in my head. To be blunt: I was bored. And even worse, I did not care. At all. Bored people who don’t care about stuff pull up YouTube and watch dumb videos. Remember how casual listeners are only half-listening because they’re doing something else while they listen to you? Chances are we only heard about half of your detailed stat to begin with. Simplify your stats as much as you can. Put them in human terms. If you insist on delivering a lengthy statistic, make like the exciting moment and recap that stat after you’ve delivered the numbers. Put it into context for the here and now. You have the unique and enviable position of being the chief basketball curator. Wield your power for the good of all who tune in. Melodie makes great points. A few things I prefer when calling a game or listening…Score and time: I feel you can’t give those enough. You never know when someone’s tuning in or out, or dozing off…Direction: Which team is traveling left to right and vice versa? Helps establish a word picture…Regularly resetting the lineups: You can’t talk up certain players and then fail to mention when they’re subbed for, or when they return…Where a team is inbounding: Near side, far side, left or right baseline? Helps reestablish the listener’s mind’s eye…What’s at stake: As Melodie says, ask yourself why should the audience care? Will this game extend a winning streak, or move a team up in the standings, or secure a playoff spot? This must be reinforced occasionally…Describing distinctive looking players: Is someone beefy, or ripped, or slender? Do they have two-tone hair, are they completely shaven, or do they wear neon socks?…Players showing emotion: Did someone just pump their first, or gesture toward the opposing bench, or stare down an official?…Don’t scream or shriek: We all get caught up in big moments, but broadcasters should know how to control their emotions and their voice. Just as we expect players not to “do too much,” we must follow suit…Lastly, never react to a big play with that tired cliche, “Are you kidding me?” No, they’re not. Trust me. Hope this helps. HI Joey — great comments by you. Shoot, your post is like a mini-play-by-play tutorial. You hit so many things right on the head. I especially love your comments reinforcing what Mel wrote about why listeners should care about this broadcast, your “don’t scream or shriek” (it might get you on SportsCenter but it sounds unprofessional) and your comment about tired cliches. When you wrote “Are you kidding me? No, they’re not,” it actually made me laugh. You are right on.